Recent research on coastal archaeology undertaken for Cadw by the Welsh Archaeological Trusts has highlighted the lack of archaeological knowledge of harbour locations and remains (Davidson A (ed), 2002 The Coastal Archaeology of Wales, 134-5). This includes both the archaeology of early landing places, the development of the medieval port, and the early post-medieval ports until they were superseded by the larger railway-linked ports of the later 19th century. The aims of this project are to undertake an archaeological assessment of five ports in Gwynedd, and to recommend management proposals that clearly reflect the use and management of the port, and will be useable by those involved with the management of ports, including harbour masters and planners. The first phase of this project has assessed the harbours of Penrhyn, Porthmadog, Caernarfon, Pwllheli and Barmouth. These all have development proposals or other pressures which either presently impact upon the archaeological resource, or have the potential to do so. A desk-based assessment has been undertaken for each. The regional Sites and Monuments Record formed the starting point, but the high number of standing buildings involved with the project meant that the records of Listed Buildings have also provided significant relevant information. Primary source material included the OS County Series maps from the late 19th century (usually c. 1888-1890) to the early 1920’s. County Tithe maps, and relevant estate maps, in particular the Penrhyn Estate maps, were also used. Harbour Trust manuscript collections were available for Caernarfon and Barmouth. Coverage, however, proved variable, for example there were significantly less maps available for Porthmadog and Barmouth than Caernarfon and Penrhyn. Secondary sources, in particular railway histories by Boyd and Baughan, were of particular use. Lewis Lloyd has provided histories of Caernarfon, Pwllheli and Barmouth, and Ellis-Evans has undertaken a similar task for Bangor (Lloyd 1989, 1991 and 1993; Ellis Williams 1988). Details of Porthmadog shipping is given in Hughes and Eames (1975). Various collections of archive prints and photographs have been collated and published, and these have been used throughout the study to avoid the need for lengthy and time-consuming archive searches through huge collections of photographs and prints. Examples of such studies include Rhyddech (1977) for Barmouth, Williams (1990) for Pwllheli, and Flynn-Hughes et al (1975) for Caernarfon and Morris (n.d.) for Porthmadog. Many of the other texts also contain large numbers of photographs and prints. The archaeological study of ports and harbours remains very much in its infancy, in Wales and elsewhere in the world. Ports themselves resist easy classification. They are called into being by a variety of factors, of which topographical suitability is only one. Some reflect the economy of their immediate hinterland, others broader commercial, governmental or strategic issues, and most will have seen a wide variety of functions. Within Gwynedd it is possible to classify the major ports into early ports, mineral harbours, packet harbours, fishing ports and general trade. Shipbuilding was undertaken alongside many of the harbours. Most ports combined a mixture of functions, though usually one was dominant, and dictated the port facilities on offer. The mineral ports include Penrhyn, Dinorwic, Caernarfon, Porthmadog and Amlwch, the first four were used primarily for slate, the latter for copper. 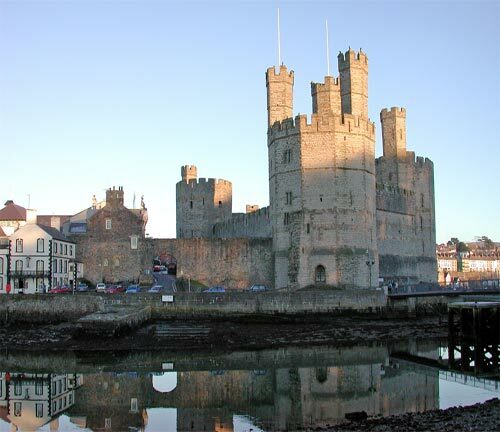 However, a medieval quay was developed at Caernarfon as part of the formation of the borough and castle, and a strong tradition of general trade and shipbuilding continued there, with slate quay looking after the slate trade, and Victoria Dock the general trade. Penrhyn was developed specifically for the output of the Penrhyn Slate Quarries by the estate, though slate was being exported from there as early as the 16th century. Porthmadog is unusual in being a late development, arising from the construction of the cob across Traeth Mawr in the early 19th century. Holyhead is the only packet harbour within the area. It was in use from the 16th century, though major construction of harbour facilities did not start until the early 19th century, when it was developed in conjunction with improvements to the London to Holyhead road and Howth harbour on the Irish shore. General harbours with a strong tradition of importing and exporting goods, in particular coal, timber and foodstuffs, are typified by the two considered in this report at Pwllheli and Barmouth. Shipbuilding industries developed at both, and both were influenced by the increasing popularity of holiday resorts in the late 19th and early 20th centuries. Similar harbours existed at Nefyn and Aberdyfi. Few improvements were made to the early harbours, though a timber quay, followed by a stone quay, is known to existed at Caernarfon in medieval times. The other harbours, though, were not developed until the rise in shipping associated with the industrial revolution at the end of the 18th century. The first quay at Penrhyn was developed after 1790, the first Act for improving the harbour at Caernarfon was passed in 1793, and at Barmouth in 1797. Pwllheli harbour was developed in conjunction with an enclosure scheme of 1811, and at Porthmadog the harbour was developed following a Parliamentary Act of 1821. The slate harbours at Penrhyn, Caernarfon and Porthmadog all developed significantly after tramways were built to carry slate from the quarries to the respective harbours. Prior to tramway construction it was possible to transport slates by road to other harbours, for example Aberogwen competed with Penrhyn (formerly Abercegin); many Caernarfon slates were formerly shipped from the Foryd, and Porthmadog was preceded by the sheltered bay off Ynys Cyngar. However once the Penrhyn, Nantlle and Festiniog railways were built (1800, 1828 and 1836 respectively) all slates for export and coastal trade were sent through the relevant port. This would change following the construction of the national railway (Chester to Holyhead in 1848, Cambrian Railway in 1867), though the changeover was not immediate, and the impact on shipping has been shown to be slighter than is often stated (see Lloyd 1989, 249-64). The general decline of the slate trade in the late 19th and early 20th centuries had a profound affect upon the harbours, and trade at all declined significantly. The late development of Pwllheli harbour in the early 20th century was an unsuccessful gamble, that never lived up to the developers’ expectations. The development of marinas at Caernarfon, Pwllheli and Porthmadog have increased activity at these harbours. Penrhyn continues to operate as a business port, and retains the feel of an industrial harbour, though it is, of course, the only one not immediately associated with a town trying to develop its tourist potential.